I was very lucky to get my nails done last night by the lovely Eve Rodgers!! Eve is an amazing beauty therapist and make up artist and one of the only people I let do my eyebrows (if you know me you know how fussy I am about my brows!!) Last night whilst having a catch up , Eve very kindly gave me HD brows and a stunning gel polish that is perfect for the festive season. I let her do whatever she wanted to my nails as she always make them look amazing! I ended up with lovely red and gold glittery gel nails!! 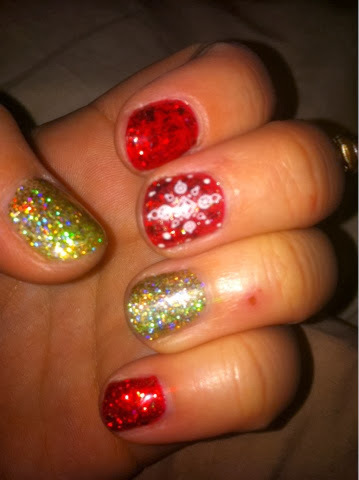 The red reminds me of Dorothy's ruby slippers and the holographic gold really sparkles! I'm a bit of a magpie when it comes to glitter! The glittery nails alone made me very happy, and then to top it of she added a gorgeous white snowflake on each of my middle fingers! I was amazed at how easy and simple it was when she applied the snowflake stamp onto my nail, and then she added extra dots to decorate the design. I'm over the moon and would highly recommend Eve for any of your beauty needs!! You can find her business on facebook, it's called All About Face.